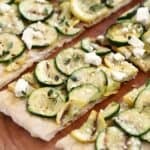 Grilled Summer Squash Pizza is the perfect light, healthy meal that can be easily adapted to a vegan meal! Preheat the grill and bring the temperature to 350 degrees. Toss the squash and zucchini together in a large bowl with the olive oil, sea salt, and black pepper. Place the squash slices on a heated grill pan or straight on the grill grates. Cook until grill marks form, then flip them over to cook the other side. Remove the cooked squash from the grill and place in a bowl. Keep warm and set aside. Press your pizza dough out to form a 10 to 12-inch circle on a floured work surface. Place the pizza dough onto the grill. Cover (close the lid) and cook for 2 minutes or until grill marks form on the bottom. Flip the pizza crust over and remove from the grill. Brush the grilled side with garlic oil, then arrange the grilled squash slices on top slightly overlapping if necessary. Return to the grill and cook until the bottom crust is golden and grill marks form. Remove the pizza from the grill and top with crumbled feta cheese and fresh thyme. Slice and serve immediately. For those who like things spicy, sprinkle crushed red pepper flakes over the finished pizza. For those who like things saucy, drizzle Balsamic Glaze over the finished pizza if desired. Add any other types of summer squash that you find interesting. Grilled onion slices would also be a nice addition if desired. If you have a large grill, preheat a baking stone on one side while grilling the squash on the other side. Never put a cold stone on a hot grill, it will crack! If you are lucky enough to have a baking steel, you can cook your pizza on the steel after the squash has been grilled. To make this pizza vegan, skip the feta cheese. Sprinkle with nutritional dry yeast for a salty, cheesy flavor.